Producing operas and educational outreach programs takes a village, and here at The Atlanta Opera we have a talented group of people who work “behind the scenes” to ensure that the art that sings continues to flourish in the Atlanta community. For those of you who have ever asked, “How’d they do that?” these next installments of The Atlanta Opera Blog are just for you! This week we go BEHIND THE SCENES with Greg Carraway, our Foundation and Grants Manager. 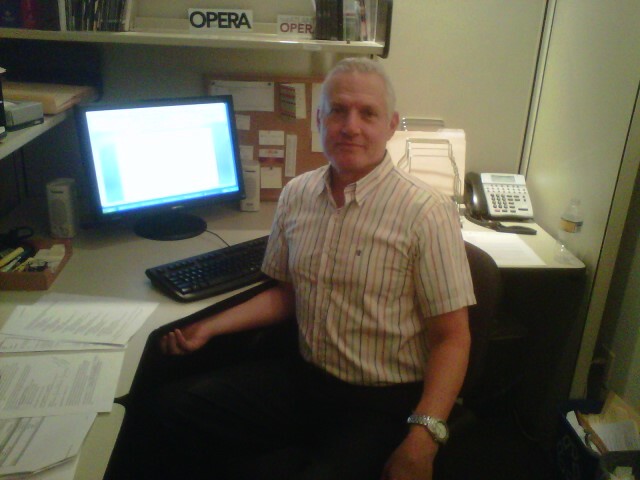 With great precision and creativity, Greg helps us find ways to fund our opera productions and education programs. Grant writing requires a multitude of skills and patience and Greg excels at all of them. So, without further adieu, here’s Greg…. 1. What exactly is a grant?A grant is money contributed by a foundation, government entity or corporate charitable giving program to an organization classified by the IRS as not-for-profit. For instance, this year The Atlanta Opera received grants from The Sara Giles Moore Foundation (private foundation), the Georgia Council for the Arts (government entity), and the JPMorgan Chase Bank Foundation (corporate giving program). 2. What is a grant writer?A grant writer is a person who writes the proposals to ask the funding entities described above for a monetary contribution in the form of a grant. 3. What are the different types of grants?Restricted grants are for specific projects or purposes as described in the grant proposal. For instance, the Norfolk Southern Foundation granted money to support our production of Porgy and Bess, which meant their money had to cover expenses for that show only. Unrestricted grants can be used however the Opera sees fit. Within the boundaries of our mission, unrestricted grant monies can go toward the myriad of educational programs the Opera offers, such as the new High School Opera Institute, or toward our main stage programming. • What expense does the Opera have that a grant might pay for? • What funder might give money to answer the Opera’s needs? Making this determination requires researching the funder’s giving priorities. • If they haven’t supported us or it has been a long time since they did, have they been contributing to non-profits like us? • Who are their board members, trustees or staff? Do I know any of them? Does anyone on our board or staff know any of them? Are any of them in our database? Have they ever bought a ticket to an opera? • Do they give grants only to preselected organizations or do they have an open call for proposals? • What are their application deadlines and when is the next one? • How much money do they generally give per grant? We stand an infinitely better chance of being awarded grant money, if we take the time to research and talk to the funders first. This is just one way the process might work. Sometimes a funder calls out of the blue and invites us to apply (the best!). Sometimes a board member contacts me with ready-made instructions for applying to a foundation. Sometimes a foundation we’ve never contacted sends a check accompanied by a cover letter of two short paragraphs (the trick then being to cultivate a relationship). As you can see, grants come about in a variety of ways. While we’re on the subject of process: it doesn’t stop with submitting a grant proposal. Progress and final reports, invitations to Opera performances and events so that the funder can experience what they’re funding, personal visits to update funders on the state of the Opera, seasonal greetings, all these and more help keep the relationship running smoothly with a funder. 5. What information goes into grants?A typical proposal includes: cover letter, application form, executive summary, narrative (the “ask,” needs statement, description of communities/populations served, description of programs/services, goals, objectives and outcomes, evaluation plan, organizational background), project budget, organization’s operating budget, audit, IRS tax determination letter, board of directors list, support materials (programs, brochures, list of schools served, reviews, photos). 6. What are some of your proudest accomplishments as a grant writer?I especially love grants that I research, cultivate and secure pretty much on my own. These are often not the largest grants, but they do make me feel validated in a way that more collaboratively secured grants may not. That said, let it be known that securing grants, like all aspects of fundraising, is mostly a collaborative effort. Doors open, ears attune and advocacy on the Opera’s behalf blossoms due to the efforts of our board members, staff, volunteers and consultants. 7. Why do you do what you do?Grant writing is what I know how to do to help make the world a better place. To be happy in my job, it’s important that I feel like I’m helping people and the community.